Lemon and Blueberries go so well together. Make this for a delicious Spring brunch. It's fun to pack up the car and head to Door County. The air is crisp, the views are beautiful and vacation is in the air. Are you vacationing this year? Any staycations? I'll be teaching at the Savory Spoon in Ellison Bay. Jan Thomas and her team are so welcoming and fun to teach with. We're making a Bistro Lunch. Oui! This fall, I'll be offering the class in North Freedom. Stay tuned for dates. There's always a pretty sunset. Isle Lavender Farm on Washington Island. PS. There are still a few spaces available for the October Paris Trip! As summer winds down and children of family and friends begin heading off to school, I'm amazed at the bounty of summer produce around us. It's been hot, cool, dry and wet all in the matter of a few weeks leading to bumper crops of tomatoes, cucumbers, zucchini and many other summer favorites. For as long as I can remember, summer suppers could be made of corn on the cob, tomatoes and lots of napkins (and butter!). Another favorite summer meal is a BLT (Bacon, Lettuce and Tomato Sandwich). While we can find tomatoes in the grocery year round, nothing beat the taste of a garden fresh tomato fresh from the vine. I've got some huge, beautiful tomatoes and lettuce from our CSA growers (a shout out to Fox Line City Farm!) I'm nearly half way to my BLT. Perfect Sandwich Bread (from The Little French Bakery Cookbook) just begs to be made into toast. A week ago, I made several loaves, so I pulled one from the freezer and it's ready to go. Now for the fun part. The bacon. Don't you LOVE bacon? Crisp, perfectly cooked bacon. Jones Dairy Farm makes delicious Cherrywood Smoked Bacon, sliced thick and just what makes the sandwich complete. Instead of using plain mayo, I've made it a bit spicy for a fun twist. And one more twist... shaved turkey! It's approaching Club sandwich status, but still fits the BLT bill. The bacon smelled so good as I cooked it. Sometimes I bake it in the oven. This time I cooked it in a grill pan on the stovetop, and set it on a paper towel lined plate to drain. Next, using a can of chipotle peppers in adobo sauce, I mixed about 1 tablespoon of the sauce into about 3 tablespoons of prepared mayonnaise. If you don't like it too spice, add less and if you'd really like a kick, add more to taste. The bread is toasted, the tomatoes sliced and I'm ready to assemble. I know some people have a special order of assembly, I like to add mayo to both slices of bread and have the tomato closest to the bread so the juice gets soaked in the bread, and doesn't run down my wrists. When I assemble, rather than breaking off the bacon to fit into the sandwich, I like to keep it hanging out. those bacon end are my first bites. And they're SO GOOD! I'm sure you'll love Jones Dairy Farm bacon. Give it a try the next time you're making a BLT or serving bacon for breakfast! Are you looking for a great bread recipe for making sandwiches and toast? My Perfect Sandwich Bread recipe makes four loaves. One to eat now, and a few to eat later. The bread freezes really well, so you could even tuck one in the freezer for another day. I've got a few classes coming up this fall. There's still room in the November 7th Croissant and Pain au Chocolat class. Hope you'll join me. Or, gather a group of friends and schedule a class of your very own. Have a great summer supper, be safe and be kind. Living here in the Dairy State, we have all kinds of dairy events. June is dairy month, and events are happening all over. Cows on the Concourse brings cows to the Capital square in Madison. Each county has a dairy breakfast where a farm is featured and breakfast is served to hundreds of visitors. Today I'm making butter. Make from the best organic heavy cream. It's easy and so delicious! Happy belated St. Patrick's Day and Happy Spring! As I write this, I'm looking out the window at snow. It's Spring, and the snow won't last long but it would be really nice to have our warmer temperatures back. I'm ready for crocus, daffodils, tulips, and muddy dog paws. There are so many fun things coming up, and I want to be sure you know about them. The Little French Bakery is going to Paris! Oui! You've read that correctly. It's going to be so exciting! I'm heading to Paris in October and this time you can join me. We'll eat, tour and shop our way around Paris enjoying all my favorite culinary delights. Burkhalter Travel is making all the arrangements for us. If you live somewhere other than the Madison/Baraboo area, I'm sure they'll help you figure out a way to meet us, or leave from your city. At tomorrow night's BRAVA Salon event, Denise from Burkhalter Travel will be there to answer questions and tell you all about it. Then, on March 25th, we'll have a information session at Burkhalter to meet and talk more about the details. Hi everyone! The Little French Bakery Cookbook is finding its way to your homes. I'm having a wonderful time seeing you at signing events. It makes me so happy that you're reading the book and trying the recipes. Thank you! Oh how I wanted my book to be perfect. But guess what? Please say it isn't so. There are a few tweaks and corrections. If you've read the story, You're My Favorite Chicken, you've learned I'm from perfect. I tried, I really tried to get the recipes perfect. Lots and lots of eyes read and prepared the recipes and some goofs still snuck through. I'm trying to remain calm, and get you the corrections right way. It's so strange that many the corrections are related to flour. Grab your copy (first edition.. Yay!) and here are some notes. - On page 137, add 1 1/2 cups flour to the Kitchen Sink Cookie Recipe. - On page 148, Perfect Birthday Cake. I transposed the numbers for the grams of flour. It should be 438 grams. This recipe make a lot of batter. Fill your three pans just over 1/2 full. If you have batter left over, you could make cupcakes! -On page 155, Marry Me Flourless Chocolate Cake, fold the flour ( or gluten free flour) into the chocolate mixture after you've stirred in the butter. - Just a note about the Banana Cake. It's sweet, dense and similar to Banana Bread. It's very tasty, though some are finding the cake texture a surprise. Use yellow, not squishy ripe bananas and it won't be so sweet. I'll keep you updated with any other changes. Thank you for your support and kindness. 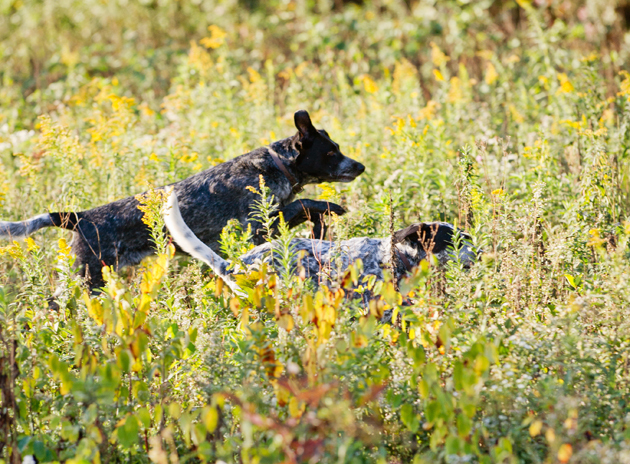 A few readers have asked why there weren't any pictures of the resident pooches. Mike and Heather Krakora of Krakora Studios took several when they were here. Here are a few of my favorites. Happy Thanksgiving to my USA readers! Countdown to the Book Release! It's been in the works for over a year, and I'm counting the days until The Little French Bakery Cookbook is released. I can't thank you all enough for your kind words of support, and interest. It's just over two weeks away, and there are some great venues available to stop by, and pick up a copy or bring your pre-ordered copy in for me to sign. For my readers too far away to stop by in person, I'll have some bookplates available (SOON!) in my website's store. Just let me know in your order who you'd like the bookplate signed for, and it will go out in the mail. Thanks again! I'll keep you posted on The Little French Bakery Facebook Page with additions, and more details for each location. Travel safe, and be kind. What could be better than make from scratch flaky, delicious croissants and pain au chocolat. This is one of my very favorite classes to teach. Here's the recipe for making your very own French vienoiserie at home. What could be better than using three sticks of butter and pounding it into a cute little square! Happy Fourth of July weekend! To celebrate, I've made all-American biscuits with Strawberry Jam. We don't eat a lot of biscuits here in the northern states, but we certainly enjoy them. There are many not-so-good (think hockey puck) biscuits. I think mine were pretty good. They were light, fluffy and had a really nice flavor. Early this Spring, Gary and I traveled to the South on a road trip. One of our stops was Charleston, South Carolina. We enjoyed a delicious dinner was at Poogin's Porch. Upon arriving, we were presented with a basket of light, fluffy biscuits. I became obsessed with biscuits and set off to find the secrets for making them, just right. As luck would have it, our hotel had a Southern Living Magazine. One of the articles was on making biscuits. I've used those tips, with others, to make some pretty darn good biscuits. Another one of our stops was Chattanooga, Tennessee to see our friends, Jerry and Nancy. I needed Martha White Flour, and my guess was I needed to pick it up before heading home if I wanted to find it. Ta-da! I quick trip to a market and I had just what I needed. As an aside, downtown Chattanooga has some great new restaurants. Back to business. The biscuits are made with flour, cold shortening, sugar, baking powder and buttermilk. To put the finishing touch on the biscuits, I'm topped them with homemade strawberry jam from my friend, Dana. She picked the berries about 1/2 mile from my house. It's SO pretty and delicious! To make the flour as light and well-mixed as possible with the other dry ingredients, I used a tamis, or French sieve. Any sifter will do. I sifted three times. 1. Be sure all the ingredients are cold. 2. Handle the dough as little as possible. 3. Make a claw shape with your fingers and use them to stir in the buttermilk. 4. Dip the biscuit cutter in flour, press straight down, and pull up. Don't twist the cutter. 5. Place the biscuits "shoulder to shoulder"on the baking sheet so they rise and don't spread out. Preheat your oven to 375 degrees F. Sift together the dry ingredients. Add the shortening and crumble together with the flour mixture until the shortening is in pea to marble sized pieces. Add the buttermilk in three additions, gently used your fingers to mix, until just combined. Pat the dough on to a lightly floured surface. Gently roll the dough to 1 inch thick. Dip a 2 inch cutter into flour, then press into the dough to cut, pull straight up/out. Repeat to cut the about 16 biscuits. Place on parchment lined baking sheet. Bake 12-14 minutes until golden brown. Brush with butter when just out of the over if desired. I've got lots more to tell you about our trip. Have a great holiday weekend. Be safe and be kind. P.S. Are you on Pinterest? How about following The Little French Bakery? Just click here. Happy St. Patrick's Day! Here are some authentic recipes straight from Ireland. Frankenfood is Coming to Madison! Attention Madison area cooks, chefs and bakers! Earlier this week I got a call from a producer from Spike Network. They produce Man vs. Food and other fun shows. They're kicking off the first season on Frankenfood and will be coming to Madison to film the show. They're looking for cook amateur or professional chefs to compete. Any skill level. How cool! The winnings? BIG! And, your recipe on the menu of the restaurant where the show is filmed. The scouts are out looking for a venue now. Just fill out the application, and find that crazy recipe. Hope to see you on TV! Please share this with anyone you think would be a good contestant for the show. Last week I had the great fortune of attending an Angela Ritchie Ace Camp, in East County Clare, Ireland. Our instructor was Béatrice Peltre. This was my first trip to Ireland. It's a beautiful, beautiful country. The landscapes, the people and feelings you get as you travel are like no other. I don't want to bore you with 900 photos, but I'd love to share a sampling of my week. I flew into Shannon, and stayed one night to shake off my jet lag. The Carrygerry guest house not too far from the airport. As I stepped out of the cab, this was my view. The answer to the question, is Ireland really green? I noticed all the blue and yellow banner flying in front of businesses and homes. It's to celebrate the upcoming Hurling Championship game in a few weeks. Country Clare is in the match, and it's not to be missed. The Irish are crazy about Hurling. After a warm, hearty dinner and a good sleep I was off the next morning to meet my classmates at the Caher House near Feakle. Yes, after asking several locals, it's pronounced just the way it looks. But with a nice brogue. This grand home was my home away from home for the class. We walked, talked, and learned so much about food styling, the ins and outs of food photography and many other tidbits. If fact, we created a Sharing List, to document all the movies and odd & ends that came up in conversation, but we knew we might forget. Thirteen women have a lot of conversations! Our first morning we walked to see the chickens and horses, and explore the property. We discovered wild blackberries which would come in handy for our food styling exercises later in the day. Our first styling exercise was styling a cute little jar of yogurt. Sounds simple? Add the spoon and the lighting with a pretty cloth and I had my work cut out for me. Here's my final result. We made a few more trips to the grocery store to pick up more jars. They'll come in handy for other photos. The best part is they all made it home in once piece. Bea (pronouced Bay-ah) presented demonstrations and ideas for styling desserts, cheeses, meats and cooked foods. Always natural light, and getting the food positioned just so. Not too much, just right. It was great fun working in pairs to style our own versions of the foods. Sometimes the food and sun cooperated, sometimes the sun went behind a cloud and changed our plans. Here are some of my shots. One afternoon just before dinner a few of us piled in a car and were taken by the grounds/animal keeper to the other side of the lake. The views were stunning. As were drove down the single land road, we came upon a herd of wild horses. They were as interested in us as we in them. Our field trips included a trip to an organic goat cheese factory complete with goats. It's a very small facility producing great cheese. Normally, the goats are out grazing but the day of our visit it was raining. The goats preferred to be inside so they were treated to fresh cut lush green grass. After my week ended, I traveled back to the Carrygerry House joining my cab driver, Finbar, for an afternoon trip around County Clare. He grew up in the area and had many ideas for things I should see before I left. My first order of business was a pair of Wellies for home. We had found several guest pairs in the basement of the Caher house and wore them into the woods and out and about on rainy days. With my country life, I thought they'd come in handy here in Wisconsin too. Finbar stopped to ask a friend where he thought would be a good spot to find Wellies. They concurred it would be Dan, Mac & Ernies. Sounded like a good spot. They told me it has lots of farming equipment and would surely have authentic Wellies. We drove into Ennis, and pulled into the farm supply store. Silly me. It wasn't Dan, Mac & Ernies. It was Dan McInerney's! I kept my phonetic spelling to myself. We quickly found the boot section. All the styles were lined up in a row. I tried on a few pair to find my size, finding the perfect pair. I was now the proud owner of real Wellies. No, I didn't wear them out of the store, but I did put them on in my room to test them out before I packed them for the trip home! After some gorgeous views, touring an Abbey, and seeing many ancient sites on the area, it was time for a bite. To accompany my seafood chowder, I had a hard cider. I'm including a shot of my first Guiness too. Delicious! I'm looking forward to my next post where I'll make Seafood Chowder and Cheddar Scones for you. The recipes are on their way from the Carrygerry House Chef and his wife, Gillian who own the Inn. Finbar drove me to the Cliffs of Moher, one of the most beautiful places I've seen. The Atlantic is all its spendor. The area is now a National Park with safety rails and a Visitors Center. Finbar showed me the spot near the edges of the cliffs where he had picnics as a child. It's great to be home and putting my new skills to work. A special thanks to Angela Ritchie of Ace Camps, Allison our talented chef, and Beatrice Peltre for her talent and great teaching skills! It's hard to contain myself. I promise not to talk too much about the book, but I've hit a milestone. The text, first pass, is finished. I've been pouring through my recipes, editing, thinking, writing, editing more, trying to find the words to describe the textures, techniques and tastes for the recipes. My first pass feels good, all 50,008 words of it. How do you estimate a word count? Well, I tried a very straight forward approach. Multiply the numbers of recipes and stories by the average number of words. I did that, and came up with 50,000. It worked! The word count isn't really a hard number. My editor gave me a range based on my proposal. My worry was if I'd be close. Too many? Not enough? The word count has been starring back at me for the past few months. When you're typing on a screen, there's nothing to show progress other than checks on lists, and the growing word count. Testing and photography modes are in full swing. I love it. I'm making the prettiest versions of the recipes I can. I'll be including many photographs in the book. It's always helpful when I see photos of finished recipes I'm trying. Now that school has started and autumn colors are creeping into landscape, it's time to think about autumn recipes. I'm thrilled to start working with apples and autumn vegetables. Today I made and photographed Tarte Tatin and Tart aux Pomme. When the autumn mood strikes you, here's my Tart aux Pommes recipe. It's an excerpt from my text. Think of this as recipe testing with me! Line a 10 inch tart ring with the pâte briséeand chill. Peel, core and chop four of the apples and place in a skillet or large dutch oven. Add 2/3 cup water, 3 TBSP butter and sugar. Bring the apples to a simmer over medium heat. Cook, stirring occasionally until the apples will squish under the pressure of your spoon, but are still retaining their shape. You may need to add more water as the apples cook. Continue cooking. The liquid should be mostly evaporated. The sugar will cause the apples to caramelize a bit. Remove the pan from the heat to cool the apples. You may wish to transfer the apples to a plate or cool baking pan to speed the cooling process. With the remaining apples, carefully peel, and core. Try not to make deep cuts into the apples. As you complete the apples, rub with lemon juice to reduce browning. Cut one apple in half top to bottom and lay cut side down. Slice 1/16-1/8 inch slices top to bottom, try to make the slices as uniform as possible. Repeat with the remaining apples. Squeeze a bit of lemon juice over the slices. Transfer the cooled cooked apples into the center of the tart crust. Spread the apples to the edges, but keep a mound of apple compote in the center, about 3/4 inch deep. Starting at the outer edge, place an apple slice with an end touching the crust, and round side slightly diagonal into the tart. Place the next slice so that it overlaps the seed side of the first slice and hides the end near the crust. Repeat until you’ve made a circle around the tart. You’ll tuck the last slice under the first. Make another ring of slices with about 1/3 of the second ring of slices overlapping the first. In the center, place some small slices, to make a tiny flower, or simply fill the space. Melt the remaining butter. With a pastry brush, carefully blot and dab the slices. Be very gentle as the the brush can easily disturb the apples. If it’s too tricky, better to have less butter than messy apples. Place the tart in the oven and bake 25-35 minutes or until the crust is deep golden brown. The edges of the apples will be deep golden as well. Remove the tart from the oven, and cool. Heat the nappage and with a pastry brush, glaze the tart with the apricot glaze. Allow the tart to set for about ten minutes, then serve. Every year about this time I get a little sentimental. Perhaps more than a little. Fifteen years ago I arrived in Paris ready to begin a journey that changed my life. There's something about the sights and smells of late summer that trigger the memories of walking to the Metro each morning, with excited and nervous butterflies in my stomach. What amazing technique and pastry were we going to learn? Would I be able to understand the Chef? And, could I get through the day blunder free? The day we made this pastry in class, it was an evening kitchen session. Our main chef had gone for the day and we had another chef, from another school guest teaching the class. I sound like a broken record, but once again he was very handsome and had even better cologne than the pastry cream chef. To top is off, he wasn't wearing the usual navy blue houndstooth checked pants. His pants were navy blue pin striped. Kim and I secretly called him Fancy Pants. He was very nice, and very helpful. (Can you see the crush coming?). Our class gathered our ingredients and proficiently made the dacquoise without fail. Then came the cream de beurre, or buttercream. Since we didn't use mixers, we needed to bring the sugar and water to the soft ball stage, and somehow pour it over the egg yolks waiting in the bowl at our work station, a distance of about seven feet. The chef, Kim and I had been chatting (in our best caveman French),trying to be welcoming to our guest. While I was bringing my sugar to temp, he walked over to make sure the next step was successful. I remembered earlier in the day that our Chef had shown us a way to measure the sugar stage by dipping a flat sieve/skimmer into the sugar and blowing into it. If you can make bubbles, out the back, your sugar is at temp. Amazing. I asked our evening Chef about it, and he said "Oui!" So I gave it a try, and to my amazement, it worked. Now I had sugar at the soft ball stage ready to pour it on the yolks. The chef stood beside me... and I froze. "Je poulet, Chef", I said. I wish I could show you the look on his face. Just think about the look a dog gets when you talk to them and they tip their head to the side. Happy, but completely confused. "Poulet? ", he said. My friends across the room roared with laughter. I was trying to tell him I was chicken. Guess what? That means nothing in French. One of my French speaking classmates came to my rescue and explained to the Chef that I was afraid to pour the sugar. He smiled and chuckled. I poured the sugar, and began whisking the mixture until it cooled and then added the butter. The buttercream was quite possibly the best thing I had ever tasted. Smooth and rich with the hint of coffee. And best of all, I had just made it. While we were working the Chef demonstrated how to make marzipan roses using the back of a tablespoon. In addition, he made a few small animals, often seen in patisserie cases. We assembled our desserts and presented them to the Chef for grading. As we were boxing our dessert and preparing for the Metro ride back to the hotel, the Chef walked up beside me, and with the biggest smile, set a little marzipan chicken of the workstation. "You are my favorite Chicken", he said. "Merci, Chef", I replied and I'm sure blushed six shades of red. I still teach students how to make roses, dacquoise and buttercream. And best of all, when Kim and I are together we often reminisce about Fancy Pants. I've been wanting to share this recipe with you for a long time. It's an incredible dessert. It's pure classic French pastry. Simple ingredients combined together to make compenents. Combined together, you won't believe how elegant yet understated it tastes. 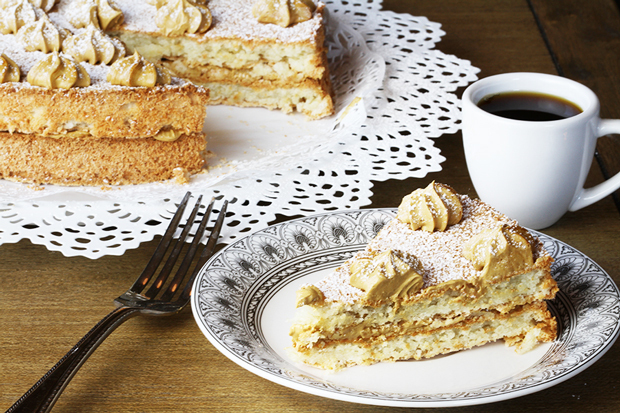 Dacquoise is a nut based merengue sponge cake, which make it naturally gluten-free if that's important for you. You can use all almonds, hazelnuts or a mixture. The key is to make great egg whites. Start with almond flour, sugar, a dash of salt, a dash of cream of tartar and eggs whites. For the very best merengue, start with eggs whites at room temperature or just a bit above. Start whipping them slowly, then gradually increase the speed. Once they reach soft peaks, add the sugar all at once and increase the mixer speed (or find a new set of arms if you're whisking by hand), and whisk until the peaks are firm and shiny. Fold in the nut mixture, then spread in a ring, or a springform pan ring. If you don't have either one, just draw two 10 inch circles on a piece of parchment paper. I highly suggest waiting until the dacquoise is cool before starting the buttecream. That way, there's no chance you'll be tempted to pipe the buttercream on warm cake. Be sure your butter is at room temperature. Heat the sugar and water in a saucepan to 238 degrees F, or 118 degrees C. Pour the hot sugar over the whisked egg yolks and whisk until lightened and cool. Then start whisking in the butter bit by bit. This is much easier with an mixer, but it can definitely be done by hand with a whisk. You may need a helper to hold the bowl while you whisk in the hot sugar so your bowl doesn't scoot away. To finish the dessert, use a thin knife with the blade pointed toward the edge of the pan, and carefully cut the cake away from the edge. Place on a plate, and pipe several rosettes of buttercream. Be sure to pipe a ring of rosettes near the edge. Set the next layer on top and garnish with more rosettes of buttercream. If you have some chocolate coffee beans, or nuts, add one to each rosette. Serve immediately, or chill and serve. I hope you'll give this recipe a try. If you've never had real French buttercream, you're in for a treat! Preheat your oven to 350 degrees F. Line baking sheet with parchment paper. Bring the egg whites, cream of tartar, and salt to soft peaks. Add the sugar and increase speed until firm, and glossy peaks. Fold in the nut flour. Spread in the rings, or spread in the circle, about 1/2 - 3/4 inch thick. Bake for 30 minutes, until golden brown. The dacquoise will rise and then settle back into the ring. Cool completely. Peel off the parchment paper, and carefully remove from the rings. In a mixing bowl or the bowl of a standing mixer, have the egg yolks ready. Be sure the butter is at room temperature.Have In a small saucepan, place the water, then the sugar and heat to 238 degrees F. Use a candy thermometer to check the temperature. When the sugar/water reach soft ball stage, slowly pour it over yolks, whisking continuously. Continue whisking by hand or with the whisk of the mixer, until the mixture is cool. If you feel the bottom of the bowl, you'll feel that the mixture is cool. Add the butter one to two tablespoons at a time, incorporating well after each addition. If the mixture breaks, keep mixing. It will come back together. Add the coffee extract to taste. The buttercream should be a rich coffee color, with a nice coffee taste. Dissolve the instant coffee in the water and bring to a boil. In another saucepan,add the sugar and heat to cook until very dark caramel color (very dark amber). Stop the caramel by adding the hot coffee. The mixture will bubble, spit and sputter. Be very careful to protect your hands and fingers. Add the coffee slowly, and stir lightly to dissolve any hard caramel bits. Strain the mixture and cool. Pour into bottles, and store in refrigerator. If you hold up your right hand, palm facing you, it's the quick reference guide to locations in Wisconsin. Follow the bottom of your thumb to the middle of your palm and that's where I live. Chicago is down at your wrist. And the thumb? Well that's Door County. The peninsula juts out and separates Green Bay and Lake Michigan. Green Bay (go Pack!) is at the bottom of your thumb followed by Sturgeon Bay, Egg Harbor, Fish Creek, Sister Bay with Gills Rock at the tip. My parents and grandparents grew up in the Green Bay area and spent lot of time in Door County. As kids we spent at least one week there each summer camping in Peninsula State Park. A gem of the Wisconsin State Park system. Every family has their favorite spots. We spent days on the lake side swimming in cold Lake Michigan at a tiny county park. It's safe to say that 99.9% of Door County restaurants have a cherry dessert on their menu. Most have a cherry pie served warm with ice cream. Orchards sell freshly picked cherries and many have pick-your-own. Shortly after we were married, Gary and I visited Door County. I couldn't wait to show him Sand Bay Town Park, the goats on top of Al Johnson's Swedish restaurant, take the ferry to Washington Island, and pick cherries. It's easy I told him. We just get buckets, reach up in the trees and fill our buckets with the tart, bright red fruit. Our trip was great and the cherries were abundant. We quickly picked a few buckets and brought them home for family and a few pies. The last few years have been tough on the cherry crop. Early thaws followed by sudden snow and storms have made the harvests small to non-existent. This year is a great year. The long spring brought many blossoms. The trees are full of cherries! Last week our friend made a trip to the peninsula and brought home a bucket of cherries. 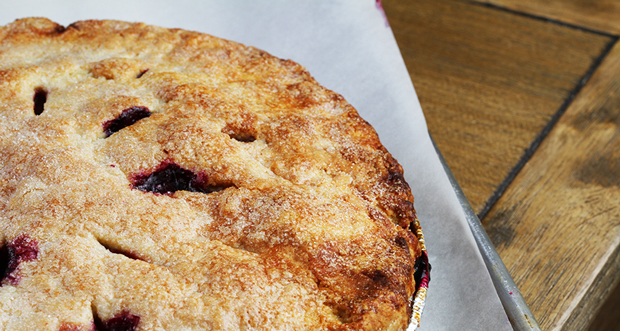 For those of you close enough to get in on cherry season, here's a pie recipe. For those too far away, pick up a bag of frozen cherries and join the fun. Even if you've never make a pie. Let's do this! First, you'll most likely need to pit the cherries. If you have a cherry pitter, you're in business. If not, a hairpin or paperclip will work. Slide the rounded end into the top of the cherry and pull of the pits. Pit the cherries over the cherry bowl so you save some of the cherry juice. I know what you're thinking. The pie sounds great, but a crust? I'm including an all butter crust recipe for your called Pate Brisee. If you're not quite ready for that, it's a-ok to purchase a refrigerated crust. The crust will happen one day. If you're making the Pâte Brisée, you'll cut the butter together add the wet ingredients into the well and chop the dough together. Here's the dough lined up, just before it gets smeared on the counter to combine. Then using a technique called Frisee, the crust is smeared between the heal of your hand the work surface to layer the flour and butter. The butter will melt in the oven and push the layers of flour apart, creating a flaky, tender crust. I added a few blueberries to the cherries to make the crust a bit fuller. Here's the fruit just before it went into the pie crust. Using a knife or bench scraper, cut the butter into 1/2 inch pieces. On your work surface, make a pile with the butter and flour. Cut the flour and butter together until you have pea sized pieces. Work quickly so the butter does not get soft or warm. Gather the butter/flour mixture and make a circle with a well in the center. It will look like a flat wide volcano, with a three to four inch open space in the center. The chefs called this a fountain. Into the center add the water, egg, sugar and salt. With your fingers, swish these ingredients together until you feel that the salt and sugar are dissolved. Using the pastry/bench scraper, cut the liquid into the flour and butter. This is when you’ll find out if your countertop is level! The mixture will be shaggy and streaks and bits of butter. Line the dough up in a long row (left to right) in front of you. The line will be about two inches thick, an inch high, and about twelve inches wide. Using the heel of your hand, smear the dough straight ahead across your work surface taking about 1/3 of the line of dough each pass. Work left to right ... or right to left. Once all the dough has been smeared, gather it back into the line and smear again. You’ll make about two to three passes. There will still be a few streaks of butter in the dough. Flatten the dough into a disk about 6 inches in diameter and 1/2 inch thick. Wrap the dough in plastic wrap or parchment paper, if you plan to use the same day. Chill the dough in the refrigerator for twenty to thirty minutes. Here's a tip: The French term for smearing the dough is fraiser (freh-zey). Rather than mixing the dough, it creates layers of butter and flour. When the butter heats, it melts and becomes steam which pushes the layers of flour apart creating a nice flaking crust. Keeping the ingredients cold and chopping rather than mixing will keep the dough light and flaky. Over working the dough will develop the gluten making the dough tough and elastic. Resting the dough will make it much easier to roll. After the cherries are pitted, drain off most of the juice, and add the cornstarch, sugar, salt and extract. Allow to rest for about 10 minutes. Roll the bottom pie crust and place in the bottom of the pie plate. I would recommend a 9" pie plate, not too deep. Place the cherries and most of the juice in the crust. Roll the top crust and drape over cherries. Trim the top crust about 1/2 inch past the edge of the pan. Turn it under the bottom crust and with your index finger and thumb of one hand, press and pinch the crust around the other index finger. Make five or six inch slits on the top of the crust. Brush the crust with heavy cream and sprinkle with sugar. Place the pie on a parchment paper or silicone mat lined baking sheet. Bake at 400 degrees for 20 minutes. Reduce the heat to 350 degrees F, and bake until juices bubble out the top slits, about 30 minute more. If the crust starts to become too brown, tent the pie with foil or just make strips of foil to protect the edges from becoming too dark. Cool completely. It's best to serve a pie the day after it's made so the juices can thicken. You'll have a much prettier piece of pie. Let me know your favorite Door County memories! If you're heading to Door County, here are some of my favorite spots. The Whistling Swan - A beautiful Inn and Restaurant. The White Gull Inn - Another great place to sleep and eat. For a fun day trip, head to Washington Island. Just a ferry ride away. Be safe and be kind. Happy Travels! Where do I purchase my equipment? Many pieces come form Paris. Here's where to shop in the City of Light.